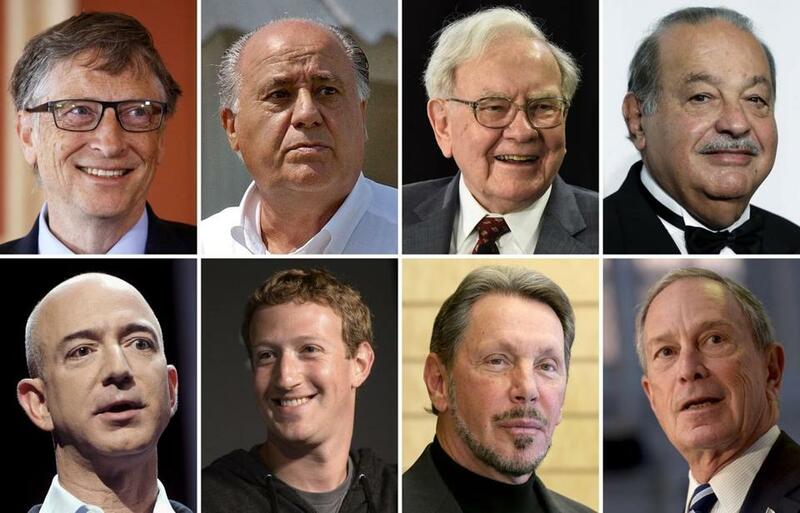 The eight richest people in the world — all men — together own about $426 billion, according to an Oxfam report. 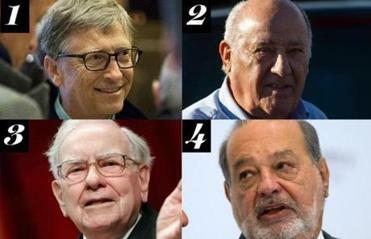 Top, from left: Bill Gates, Amancio Ortega, Warren Buffett, and Carlos Slim. Bottom, from left: Jeff Bezos, Mark Zuckerberg, Larry Ellison, and Michael Bloomberg. Just eight people own more wealth than half of the world, according to a new analysis that highlights the massive gap between the haves and the have-nots. The eight richest people in the world, all men, together own about $426 billion, according to the report from the charity Oxfam. On the opposite end of the spectrum: The poorest half of the world’s population, some 3.6 billion people, collectively own about $409 billion in wealth, said the report, the latest installment in a series of annual inequality reports. “It is obscene for so much wealth to be held in the hands of so few,” said a statement from Oxfam executive director Winnie Byanyima. Collectively, they own an estimated $426 billion. Meanwhile, the poorest half of the world owns an estimated $409 billion. Wealth is good, and the more people who can create and earn it, the better. The report said that its estimate of the bottom half’s wealth accounts for people who have negative wealth, or more debt than assets. The poorest 10 percent of the global population collectively has $1.1 trillion more in debt than it does in assets. That figure gets subtracted from the rest of the bottom half of the world’s population, which collectively has $1.5 trillion in positive net wealth, or more assets than debt. To be sure, some people with more debt than assets would not normally be described as “poor,” the report said. The report also said that, based on the rate at which the richest are accumulating wealth, the world may see its first trillionaire in just 25 years. “To put this figure in perspective — you would need to spend $1 million every day for 2,738 years to spend $1 trillion,” the report said.